At Christmastime, when the hot buttered rum and homemade toffee are plentiful and the holiday music is on 24/7, I always find myself telling people the one thing my ex-husband had right about me: he called me a Christmas Crackhead. The title has stuck and I wear it with pride. In my home are enough Christmas trees that I can read by their light in the middle of the night. 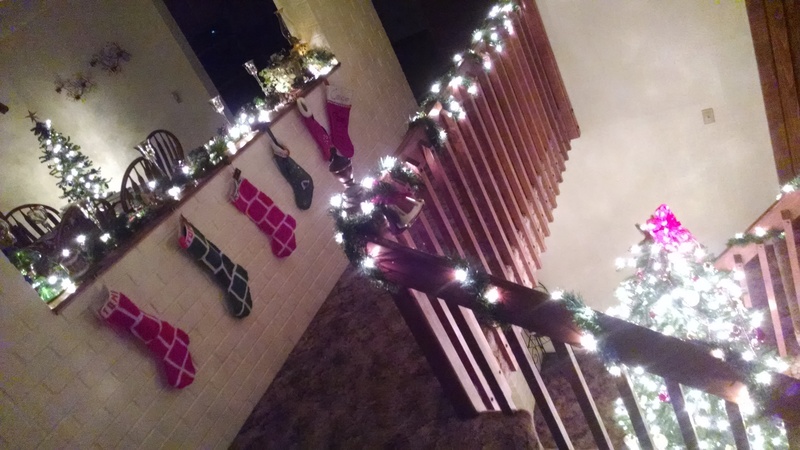 One in my dining room stays up year-round, its décor changing with the seasons. One is specifically for travel memories; another is for the homemade ornaments I made as a kid and the ones Emily makes. My living room tree is all earth tones to match my “burnt pumpkin” colored walls and my 9-footer in the split-entryway, seen from both downstairs and upstairs, is always a traditional red and gold theme. Another is all blue and silver to complement the gorgeous snowman-themed tree skirt my mom made for me years ago. I start filling out my calendar with local Christmas activities well in advance so we can take in all the special events we love. Emily and I have many favorite traditions—all of them free or cheap—and every year, we try to fit in as many as possible. Seeing the Trees of Elegance at The Davenport Hotel is a must, as is going caroling, attending a potluck with our dear Sisters of Providence, driving around to see light displays, going on a horse-drawn carriage ride through downtown, and many more. At home, we have a “red box/green box” game where we hide little trinkets or messages for each other, and together with my parents, we enjoy Advent reflections and candle lighting every Sunday evening. As is customary in many homes, we also do our share of holiday baking and deliver goodies to friends and neighbors. The Grinch’s revelation, and the Madonna & Child, as seen from a skywalk in downtown Spokane. I saw those words in the most interesting venue yesterday. Emily was shopping in the Santa’s Express—a place where elves help children choose gifts for their parents, and all the proceeds benefit a local charity—and I was waiting in the nearby skywalk connecting two downtown buildings. 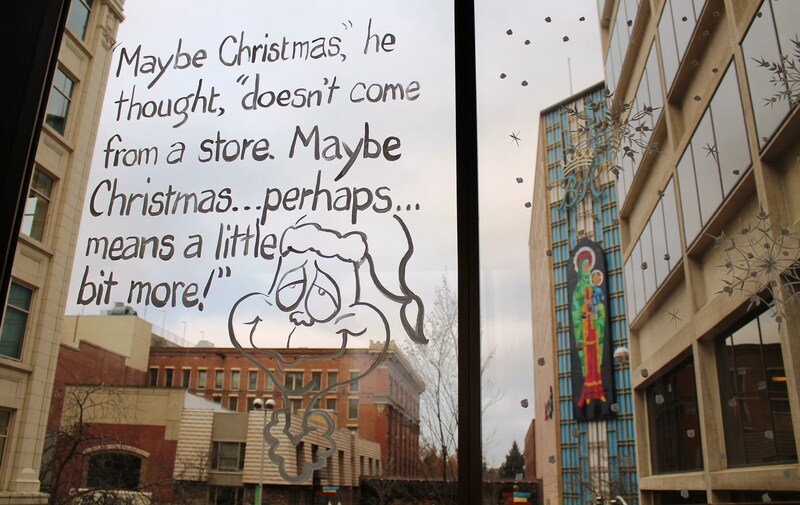 A window artist had painted scenes from The Grinch on each pane, and as I enjoyed his or her beautifully done snowflakes, I came upon The Grinch’s revelation positioned so you’re also seeing the two-story Madonna & Child displayed on the Macy’s building. Clever. Am I ready for Christmas? Of course. Always and forever. Because I’m a Christmas Crackhead and I can’t get enough of the hope and peace and goodwill that can be found in so many places if we take the time to look.